Departement of the Alpes de Haute Provence - Pop. : 8,000 inh. 185km. from Nice, 135 km. from Marseille and 130 km. from Avignon. 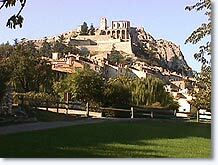 Take highway A51 exit Aix-Sisteron, or RN 85 (Napoleon's Road), or RN 100 from Forcalquier. 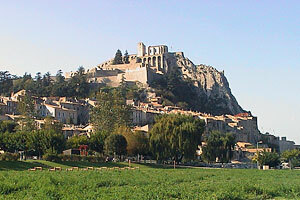 It is called the "Pearl of Haute Provence". 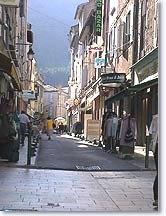 Sisteron, this historically important city, once the site of both misery and glory, is now a leading city in the Alpes de Haute Provence. The Mediterranean sun shines down on the decor that announces the proximity of the Alps. 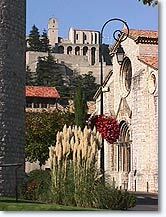 With its exceptional heritage, and its equally exceptional setting, Sisteron will certainly delight its visitors. 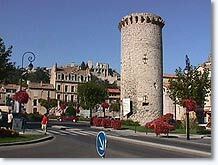 The fortified citadel which crowns the city and overlooks the Durance river is a complex of diverse architectural periods including the 12th, 14th, 16th, 17th, and 19th centuries. Inside the walls is the Notre Dame du Chateau Chapel and two museums. From the terrace of the Citadel there is an excellent view of the old city down below onto the timeworn tile roofs of the houses lining the river banks. This ancient part is quite captivating with its tiny squares planted with trees and fountains gushing here and there throughout the winding streets. Along the river banks several beaches have been fitted out to the joy of big and small during those hot summer days. 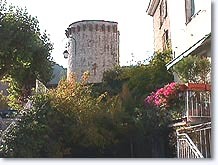 Citadel. Notre Dame du Chateau Chapel. 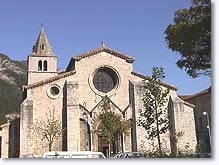 Notre Dame des Pommiers Cathedral (1200). St. Dominique Convent (1248,1620). St. Marcel Church (12thc.). City towers (1370), old city, ruins of the Cordeliers Convent. Hiking on marked trails. Botanical trails. Fishing. Guarded swimming. Tennis. Swimming pool. Minigolf, Climbing, Horseback riding. Gliding. Paragliding. ULM. Excursions. Guided tours of the city. Slide show. Exhibitions. Festival of classical music. Cinemas. 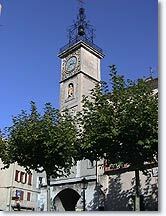 Entrepierres (10km), Salignac (10km), Bevons (12km).